Our final Path to Glory for the time being (we'll be back with more in the 2019 offseason) falls somewhat in the middle of those diverse examples. It comes from a fairly memorable game, but not one that was part of a playoff campaign. The primary player involved is surely still a household name for many Tampa Bay fans, but he was only a Buccaneer for three seasons. Like the Blount run we diagrammed last week, this one is also a feat of athleticism, but while Blount relied on his power to forge an unforgettable run, this player created a lasting memory by being impressively nimble. And, without giving too much away, this isn't even that player's most memorable moment as a Buccaneer. It's a good one, though. See if you can figure out what it is before the reveal below. First, let's remind everyone how this works. To start things off, we'll show you a field with the paths of the players involved drawn on it, but without any other identifying characteristics. You've probably already noticed this week's diagram below; resist the urge to scroll farther down until you've tried to guess what memorable play it depicts.  Some diagrams will show just one player's path, others will outline the motions of several players.  If the football travels in the air between players during the play (including on a shotgun snap), that will be shown with a dotted line. After you've had a chance to guess the play from the first diagram, we'll provide you with some hints and then show it to you again with some more details to help those who weren't able to pinpoint the play initially. Then, as your reward for guessing the play, we'll finish up with an animated diagram and the actual video clip of the play. Can you tell which play is being depicted? Let's break it down a little bit. Given the parameters that we outlined above, this play would seem to make little sense. As noted, dotted lines depict the football traveling through the air, and it's hard to understand how a football could possibly travel the path described above. The first part is relatively simple. The player on the left side of the diagram starts the play with the ball and then it leaves him through the air. That's essentially the definition of a quarterback, so we can make an educated guess that this is a QB throwing a pass. It's where the second offensive player and the first defender intersect that things get a little crazy. Perhaps something happens to disrupt the initial path of the football through the air. In any case, it appears to end up where it belongs, as the second part of the dotted line meets up with the end of the second offensive player's path. It's also worth noting the lines on the right side of the diagram. Those are yard markers, and the one at the top looks an awful lot like a pylon. Could this not only be a strange and memorable passing play, but also a touchdown? Finally, note that there is a second defender in the vicinity of the offensive player who is ostensibly make the catch. So you've got a relatively short pass for a touchdown, but one that takes a strange turn near the end and requires the offensive player to navigate some heavy traffic in order to come up with the ball. Does that sound familiar? The receiver here is Joe Jurevicius, a member of the 2002 Super Bowl team who spent three seasons in Tampa after starting his career with the New York Giants for four years. After the 2004 season, Jurevicius would move first to Seattle for one year and then to his hometown of Cleveland for two final campaigns with the Browns. Jurevicius, of course, is best known for the 71-yard catch-and-run he made in the first half of the 2002 NFC Championship Game in Philadelphia, the play that shifted the momentum after the Eagles had scored quickly to take the lead. Not only was it a special play by Jurevicius, who seemed to run faster than he ever had before in pulling away from several Philly defenders, but it was a moment fraught with emotion. Jurevicius had only joined his team in Philadelphia the night before the game, as he had stayed back in Tampa with his infant son, Michael, who was fighting an ultimately unsuccessful battle against a rare ailment. After beating the Eagles to move on to Super Bowl XXXVII that January, the Buccaneers started their 2003 title defense with a Monday Night Football matchup with the same team. It was a bit unusual for the champions to be sent on the road for that marquee opener, but the Eagles had a brand new Stadium – Lincoln Financial Field – to celebrate after the Buccaneers closed Veterans Stadium. The Buccaneers didn't have much problem taking their show on the road, as they dominated this game from start to finish. Tampa Bay's defense held Donovan McNabb and the Eagle attack to 245 total yards and two of 11 third-down conversions. Simeon Rice had two of the Bucs' three sacks of McNabb and Anthony McFarland picked him off midway through the fourth quarter. The Eagles only penetrated Tampa Bay's red zone once, and that drive came up empty when the Bucs stopped four straight plays from the one-yard line. Martin Gramatica's 23-yard field goal provided the only points of the first half, but Jurevicius put the game away after the break with a pair of touchdown catches. The second one is diagrammed above. On third-and-six from the Philadelphia seven-yard line, the Bucs lined up three-wide, with Keyshawn Johnson on the line of scrimmage and standing on the right hash mark. Jurevicius is lined up a few yards to his right and off the line of scrimmage. At the snap, Johnson runs straight into the end zone and then cuts out toward the right sideline. Jurevicius takes a few steps forward then bends a shallow route out towards the right, at about the two-yard line, a yard short of the sticks. Quarterback Brad Johnson takes the snap and drops back, looking quickly towards Jurevicius and releasing a quick throw in his direction. Johnson's pass comes in a little high and behind Jurevicius, who leaps with both hands up and manages to tip it up with his right hand as cornerback Troy Vincent closes in. Vincent goes for the ball, too, which allows Jurevicius to stay on his feet. The Buccaneers receiver somehow knows exactly what he has done and he wheels to his left, looks up and spies the ball floating down to the turf. He takes a couple quick steps in that direction, crossing the goal line, but also notices that cornerback Sheldon Brown, who had been covering Keyshawn Johnson, has peeled off his man and is racing to get to the ball, too. Showing amazing awareness and body control, Jurevicius dives and plucks the ball out of the air right above the waiting hands of Brown, who had also dived and rolled over to get between the falling ball and the turf. The pass originally could have been intercepted by Vincent at the two-yard line, and the tipped floater almost certainly would have landed in Brown's hands for a pick in the end zone, but the incredible series of moves by Jurevicius turned it into a Buccaneers touchdown. Tampa Bay won, 17-0. So now you've seen the strange but ultimately successful path that Joe Jurevicius took in creating one of the most impressive catches in franchise history. 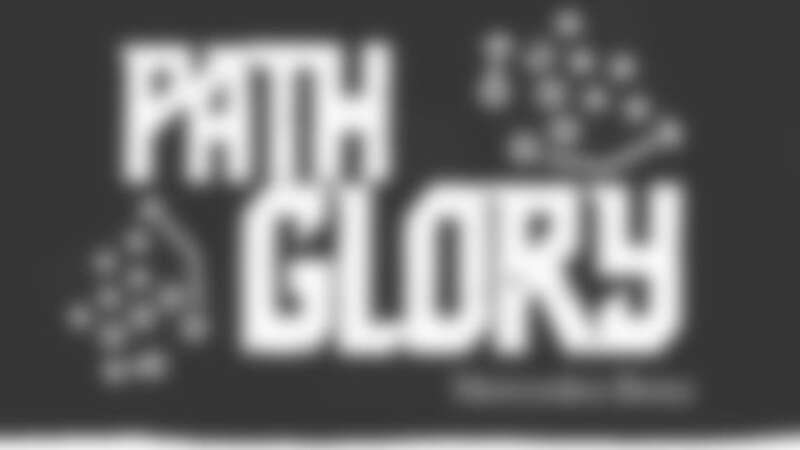 We'll be back in 2019 to challenge your memory again with more Paths to Glory. Can you identify a seminal moment in Buccaneers history using only a diagram showing the ground covered by the key players?